Turkish Airlines is planning further growth in Africa in 2015 with at least six new destinations. Turkish already has the largest network in Africa among foreign carriers, overtaking Air France and Emirates as it has added a staggering 25 African destinations over the last three years. By the end of 2015 Turkish will have at least 45 destinations in its African network across 30 countries. North Africa continues to account for most of its African capacity but Turkish also has established a large presence in east, central and west Africa. Turkish is able to enter relatively thin underserved African markets by offering a myriad of connections to Europe, Asia and the Americas. Narrowbody aircraft have been the driver of its African expansion strategy as it has used 737-900ERs to open up destinations as far as seven hours from Istanbul. Turkish Airlines CEO Temel Kotil said on the sidelines of the 17-Dec-2014 Star Alliance executive meeting in Delhi that six of the 15 destinations the carrier plans to add in 2015 will be in Africa. This includes two unnamed destinations in Egypt, Abuja in Nigeria, Bamako in Mali, Conakry in Guinea and Juba in South Sudan. Among the six planned new African destinations Turkish so far has only set a launch date and begun sales for Abuja, which will be served five times weekly from 3-Mar-2015 with 737-900ERs. Abuja will be Turkish’s third destination in Nigeria after Lagos and Kano. Turkish currently serves 39 destinations in Africa across 27 countries, according to OAG data. Bamako, Conakry and Juba will extend Turkish’s African network to 30 countries as the airline does not currently serve Mali, Guinea or South Sudan. Turkish has not yet set launch dates for any of these routes, some of which are likely to be tagged to existing destinations, following the normal Turkish formula for expanding to thinner African markets. Conakry is also not expected to be launched until the Ebola virus, which has significantly impacted traffic in Guinea, subsides. Turkish will be the fourth airline from outside Africa to serve Abuja, joining British Airways, Emirates and Lufthansa. It will be the third non-African airline in the Bamako market after Air France and TAP Portugal. Air France and Brussels Airlines serve Conakry while flydubai is the only non-African airline serving Juba, according to OAG data. In Egypt Turkish already serves four destinations – Alexandria, Cairo, Hurghada and Sharm el-Sheikh. These are the four largest international airports in Egypt based on current seat capacity. There are currently another six airports in Egypt with international services but only three of these are significant (over 1,000 weekly seats) – Luxor, Marsa Alam and Sohag. All three could potentially support service from Turkish, particularly given the airline’s typical low frequency small aircraft strategy for serving secondary markets in Africa. The only African country that currently has more than four destinations is Algeria, where Turkish serves Algiers, Batna, Constantine, Oran and Tlemcen. Algeria and Egypt are logical markets for Turkish given their proximity to Istanbul. The two combined account for about one third of Turkish’s total African capacity. North Africa overall accounts for 56% of Turkish’s total African capacity – or about 5% of its total global seat capacity. Central/West Africa and East Africa each account for approximately 20% of Turkish’s African seat capacity while Southern Africa, where Turkish currently has only one daily flight on an Istanbul-Johannesburg-Cape Town rotation, accounts for only about 5%. Turkish is keen to pursue opportunities for expansion in all regions of Africa. In North Africa there are clearly expansion opportunities in Egypt, particularly as Egypt’s tourism sector gradually recovers. Turkish has about a 5% share of international seat capacity in Algeria and a slightly less than 3% share in Egypt. It has about 8,600 weekly seats in Algeria and about 14,000 weekly seats in the larger Egyptian market, according to CAPA and OAG data. The six new destinations will also extend the gap between Turkish and its rivals in the Gulf, which have also been pursuing rapid expansion in Africa. Emirates currently serves 22 destinations in Africa while Qatar Airways has 19 and Etihad only seven, according to OAG data. Air France has the second largest African network after Turkish among European carriers with 34 destinations. Turkish is categorised as a European carrier and is a member of the Association of European Airlines but strategically is more like a Gulf carrier. Turkish also competes more with the Gulf carriers given Istanbul’s location at the crossroads of Europe and Asia, including for passengers travelling between Africa and Asia. European and Gulf carriers both compete for Africa-Europe and Africa-North America traffic. While Turkish has more destinations, Emirates is still by far the largest foreign carrier in Africa based on capacity. Emirates has about twice as much seat capacity as it is an all-widebody operator while most of Turkish’s African routes are now operated with narrowbody aircraft. Air France is also nearly 50% larger in Africa based on seat capacity. In addition Emirates has more flights in the African market than Turkish. Turkish currently operates 432 weekly frequencies while Emirates operates 477 frequencies, according to OAG data. Air France also has slightly more frequencies in the African market, with 456 based on schedules for the week commencing 22-Dec-2014. Turkish, however, has been growing faster in Africa than Emirates and much faster than Air France. Since Dec-2011, Turkish has nearly doubled its seat capacity to Africa from about 38,000 to about 70,000 weekly seats. In the first 11 months of 2014, its ASK growth to/from Africa was 15%. Emirates capacity to Africa has increased over this period by approximately 65% from about 90,000 weekly seats to nearly 150,000 weekly seats, according to CAPA and OAG data. Air France capacity to Africa has been relatively flat over the last three years. If Turkish is able to resume services to Benghazi, Sabha and Tripoli in 2015 its network in Africa would grow to 48 destinations when factoring in the 39 existing destinations, the six new destinations and potential three resumed destinations. Turkish already resumed services in Oct-2014 to Misurata in Libya. Turkish originally launched services to Misurata in Dec-2011 – the first of a string of 25 new African destinations added over the last three years. Adding 25 destinations in a single region in a span of only three years is an impressive accomplishment and has required significant investment. Only a few airlines have added that number of destinations globally over the last three years. Turkish also has added capacity over the last three years to several of its original African destinations. For example Accra, Alexandria, Dakar, Dar es Salaam and Entebbe have all been upgraded to daily (from three or four weekly frequencies) while the Lagos flight has been up-gauged from 737-900ERs to A330s. South Africa is one of only a few African markets where Turkish has not increased capacity since Dec-2011. But Turkish recently announced plans to launch daily non-stop flights to Cape Town from 25-Oct-2015. This will result in a doubling of the carrier’s capacity to South Africa, which is currently served with one daily flight on an Istanbul-Johannesburg-Cape Town routing. Turkish also has been looking at serving Maputo in Mozambique and Luanda in Angola. The airline initially unveiled plans in late 2012 to serve Maputo but never launched flights. Turkish announced plans to launch service to Luanda in Sep-2014 but after delaying the launch the route was scrapped. Maputo could be revisited in 2015, potentially as a tag to Cape Town or Johannesburg. Luanda also remains a possibility although at this point not as likely as Maputo. Either would give Turkish a third destination in Southern Africa. Southern Africa is the most challenging of the African regions for Turkish to penetrate because it is the only region that cannot be served with narrowbody aircraft. Turkish has a primarily narrowbody fleet and long-haul growth aspirations in the Americas and Asia compete for its relatively limited number of widebodies (about 60 aircraft). But as Turkish expands its widebody fleet, and its network in the Far East and the Americas start to mature, there should be opportunities to pursue more widebody flights to Africa. Turkish has long been pondering an order for additional widebodies (beyond the 12 A330-300E and 16 Boeing 777-300ER aircraft that are currently on order, according to the CAPA Fleet Database). It is reported to be considering A330neo and A350 and Boeing 777X and 787 aircraft. At the larger end of the twin aisle market, Turkish is also reported to be considering the A380 and 747-8 aircraft. Johannesburg, Cape Town, Casablanca and Lagos are currently Turkish’s only African destinations that are entirely served with widebody aircraft. Widebodies are also used on a limited basis (certain frequencies during peak days or peak seasons) on some dense short-haul routes to North Africa. Casablanca and Lagos are also within narrowbody range but are served with widebody aircraft to meet high demand. Lagos was up-gauged from 737-900ERs to A330s in 2013. Turkish primarily operates 737-900ERs on long thin routes to Africa while its other narrowbody types – including 737-700s, 737-800s, A319s, A320s, A321s – are used on shorter routes. Turkish began operating 737-900ERs in late 2011 and has since been using the type to pursue expansion in sub-Saharan Africa. 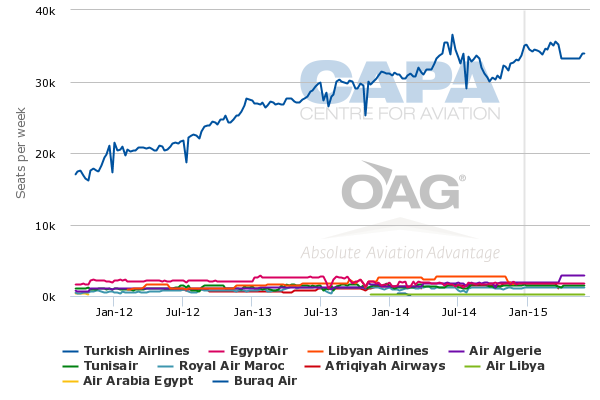 Turkish currently operates 10 737-900ERs with five more on order, according to the CAPA Fleet Database. Turkish now relies entirely on the 737-900ER to serve 14 of its African destinations. Almost all these flights are over six hours in duration and in some cases are over seven hours. The 737-900ER is also used on some short-haul flights to Africa but generally Turkish uses other variants of the 737 or A320 family aircraft on its North African routes. Turkish operates its 737-900ERs in a light 151-seat two-class configuration consisting of 16 business class and 135 economy seats. This gives the airline the opportunity to fully utilise the aircraft’s range. Africa has the yields and premium traffic to make such a configuration work, particularly as most of the markets served with the 737-900ERs have limited competition. Turkish configures its smaller 737-800s with more seats – 155 to 159. Turkish also operates A321s, which is similar in size to the 737-900 but has less range. Turkish configures its A321s with 188 seats and generally uses the aircraft on short dense routes including to some destinations in North Africa. Turkish also uses 126-seat A319s on some African flights but generally short and thin routes. Turkish has fewer 737-900ERs than any other narrowbody type. But the aircraft has an important niche and has been essential in developing the carrier’s African network. Turkish included 10 737-9s in its 2013 order for new generation 737 MAX aircraft, an indication that the airline plans to maintain a sub-fleet of the largest 737 variant well into the future. The 737 MAX 9 will also offer improved range, giving Turkish an opportunity to use narrowbodies to penetrate deeper into Africa while improving the economics of its current 737-900ER routes. Africa has a rather niche role in the Turkish network as it only accounts for about 10% of the carrier’s total seat capacity. But it is an important niche and one Turkish is obviously keen to grow as it continues to pursue rapid expansion globally. Offering a large and unmatched African network gives Turkish a competitive advantage as it is able to offer more city pairs to and from Africa than any other carrier. The Africa market is relatively small but is growing rapidly and is generally high yielding. Turkish has the right fleet mix and the global network required to successfully exploit some of the huge opportunities Africa offers. Turkish will not be shy to continue testing out new African destinations, particularly as it is able to significantly mitigate risk by deploying narrowbody aircraft and tagging destinations.